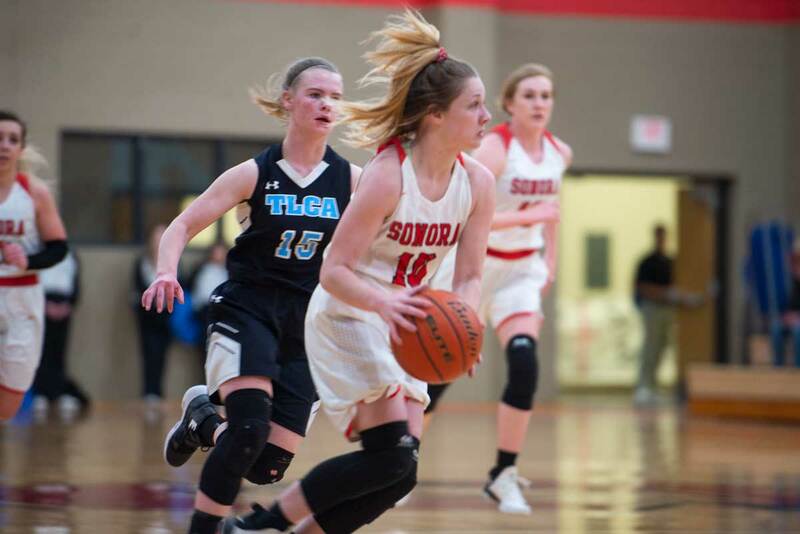 SONORA, TX — The Sonora Lady Broncos clinched a playoff spot for the first time in four years with a 52-24 win over TLCA Tuesday night. Sonora hounded TLCA in the first quarter, leading to a 15-4 margin. Sonora continued to press on the gas, scoring a large portion of their points off turnovers. Six points from Brae Harris and four from Skylar Harris helped Sonora to a 25-10 halftime lead. The Lady Broncos used a 12-2 run in the first five minutes of the third quarter to keep their momentum. Six points from Mary Kyle Johnson and another four from Skylar increased Sonora’s lead to 42-14. The Lady Eagles has their best quarter in the fourth quarter, scoring 10 points behind five points from Yareli Pecina. Skylar Harris had the game-high of 17 points. Johnson finished with 11 points and nine steals. Karli Bucks led TLCA with seven points. Sonora (24-7, 7-4) will have Friday off before concluding the regular season at Grape Creek on Feb. 5. TLCA (2-14, 1-9) will travel to Grape Creek on Friday. Julissa Ureno and Braylee Hood played a massive role in lifting the Robert Lee Lady Steers to a 43-40 win over no. 20-ranked Blackwell at home on Tuesday. Robert Lee held a narrow 10-9 margin going into the second quarter behind four points from Braylee Hood. The two teams combined for 31 points in the second quarter. Seven points from Ureno and a three from Ken Puentez helped the Lady Steers take a 26-24 lead into halftime. Both teams opted for defense in the third quarter, scoring 12 total points. Megan Grantham had four of Robert Lee's six to help them maintain that two-point lead at 32-30. Hood then found her rhythm in the fourth, scoring five of Robert Lee's 11 points to seal the win. Robert Lee (20-5, 7-3) will travel to Sterling City this Friday looking to maintain their half-game lead on Water Valley for the third and final playoff spot. The no. 4-ranked Garden City Lady Bearkats claimed the District 8-1A crown with a 38-19 win over second place and no. 25 Sands on Tuesday. The Lady Kats used defense in the first half, holding Sands to just eight points to take a 17-8 lead into halftime. Lyndee Walker decided to take things up a notch in the third quarter, scoring seven points for Garden City. Ixchel Sotelo followed suit with four points. The Lady Kats would lean on those numbers to push their lead to 30-15. Once again, Garden City leaned on their defense to shut down Sands in the fourth quarter. Sands was held to just four points in the final frame as Garden City cruised to the district title behind six more points from Walker. Walker dominated the scoreline with 19 points for Garden City. Her next closest teammates were Sotelo and Allison Halfmann with six points each. Garden City (26-3, 7-0) will next travel to Grady on Feb. 1. Three players scoring in double figures helped the Water Valley Lady Wildcats to a crucial 53-43 win over Bronte on the road Tuesday. The two teams held level at 9-9 after the first quarter. Water Valley's Kirstyn Greenbon had five points while a three from Bronte's Jayden Speary and two points each from Kristen Stilley, Karissa Cervenka and Cassidy McWright kept the game even after the first quarter. The Lady Wildcats then kicked it into high gear in the second. Shelby Kolls posted seven points, Kenzie Jordan had six while Greebon and Kalysta Minton-Holland combined for four to give Water Valley a 26-18 lead at the half. Four points from Cervenka helped keep Bronte in the game at that point. However, Water Valley found a way to hold Bronte in check in the third quarter. The Lady Longhorns were held to just seven points in the quarter behind a three from Speary and four combined points from Cervenka and Stilley. In turn, Water Valley kept their foot on the throttle with Greebon notching seven points in the third and Kolls hitting a three to push Water Valley to a 43-25 lead after the third quarter. Speary would then find her rhythm for the Lady Longhorns with a pair of three-pointers and seven fourth quarter points as Bronte exploded for 18 points, but it wasn't enough. Kolls finished with 16 points to lead Water Valley. Greebon finished the game with 14. Jordan notched 13 points for the Lady Wildcats cause. Speary finished with 14 points for Bronte. Bronte falls to 3-7 in district play. They'll travel to no. 20 Blackwell this Friday. The no. 1-ranked Wall Lady Hawks picked up their 17th straight win and a share of their 11th straight district championship with a 67-13 rout of Brady on Tuesday. The win came thanks to an utterly explosive first half. Behind 17 points from Sawyer Lloyd, seven from Kylie Phillips and a pair of three-pointers from Landry Reynolds, Wall held a 47-4 lead at the half. Kayde Raybion and Journey Roddie tallied the only points for Brady in the first half. Wall was held relatively quiet in the third quarter, scoring nine points. Four free throws from Roddie and Areana Regan started an upward scoring trend for the Lady Bulldogs. That trend continued in the fourth, as Raybion tallied Brady's five fourth quarter points to finish the game. Behind Reynolds' third three of the game, Wall would extend their lead to 54 points. Lloyd had the hot hand for Wall, finishing with 19 points. The next two closest Lady Hawks were Reynolds and Haley Palmore with nine points. Raybion led the way for Brady with seven points. Wall (25-1, 11-0) will look to clinch the outright district title against Ballinger on Friday at home. Brady (7-12, 4-6) falls into a tie with Reagan County for fourth place in District 4-3A. They will look to settle that tie in Big Lake this Friday. The no. 3-ranked Mason Cowgirls used 16 three-pointers en route to a 75-41 win over third place Harper on Tuesday. From the start, the Cowgirls showed why they're ranked third in Class 2A. Tessa Guice hit two of Mason's four first quarter three-pointers to take a 19-9 lead into the second quarter. The Cowgirls were just getting started. In the second, Mason hit another three three-pointers to help extend their lead to 41-18 at the half. Allie Guice would drain a pair of Mason's four three-pointers in the third quarter as the Cowgirl lead grew to 57-29. Mason's cherry on the top was the fourth quarter where five players, including senior post Ruby Mangus, each hit a three. Mangus would finish with a game-high 17 points. Tessa Guice was second on the team with 14 points. Presley Anastas had 10 points, nine of which came from behind the arc. Mason (30-1, 6-0) will look to clinch the outright district championship on Friday at Junction. The Central Lady Bobcat’s defense rolled over Abilene High Lady Eagles in a 45-17 win. The Lady Cats came out and played great defense by holding the Eagles to only one field goal. They took a 7-2 lead into the second quarter. The second quarter was were Central really took over the game. Parris Parmer had eight points in the quarter which brought their lead to 26-8. The Lady Eagles didn’t fix much at halftime because the Lady Cats dominated them in the third quarter. Parmer had another five points in the quarter. Since Central only allowed one field goal, the score was 40-11. The starters for Central hardly played in order to get rest, but the bench still played tough against the Lady Eagles. They beat the press with ease and sealed the 45-17 win. Parris Parmer had 16 points. Central (26-6, 9-1) will travel to Fort Worth Richland this Friday looking to keep their district title hopes alive. The Chistoval Lady Cougars had to overcome a slow first quarter for a 40-21 win over the Miles Lady Bulldogs which gave the Lady Cougars a share of the District 7-2A title. The first quarter was where Miles played well, but they slowly started to fade away. The Lady Bulldogs led 11-8 after the first quarter behind a three-pointer from Halle Hudson and four points each from Tycie Lange and Skyler Brooks. The second half wasn't as close as the first. The Lady Bulldogs only had two field goals. As for Christoval, they scored 10 points. Sterling Baker had six points in the fourth quarter to help finish off the Lady Bulldogs. Baker and Jones both had nine points for Christoval. Christoval (20-10, 8-0) will host Forsan this Friday while Miles (7-13, 3-5) will host Eldorado on the same day. The Eldorado Lady Eagles snatched a 49-38 win over Winters on Tuesday to bounce back from their Forsan loss. With Jayden Martinez being leading score, and the Lady Eagles solid defense, they were able to hold the Lady Blizzards to take a 17-9 lead in the first quarter. Winters kicked it up a notch by outscoring the Lady Eagles with consecutive threes early in the second half. Eldorado's Vic Dehanis, Emmie Mynatt and Codee Meador all tie as leading scorer in the third quarter only scoring six points total. Making up for their lack of points the Lady Eagles held the lead with their aggressive defense in the fourth quarter. Eldorado (18-7, 6-2) will travel to Miles this Friday. Winters (8-21, 0-8) hosts Ozona on Friday.